What to do after it\'s been done! Usually younger patients seem to do things that they normally wouldn’t have done had they been told to do more research. Many clinics still perform procedures that have been declared to produce the “doll head” effect. 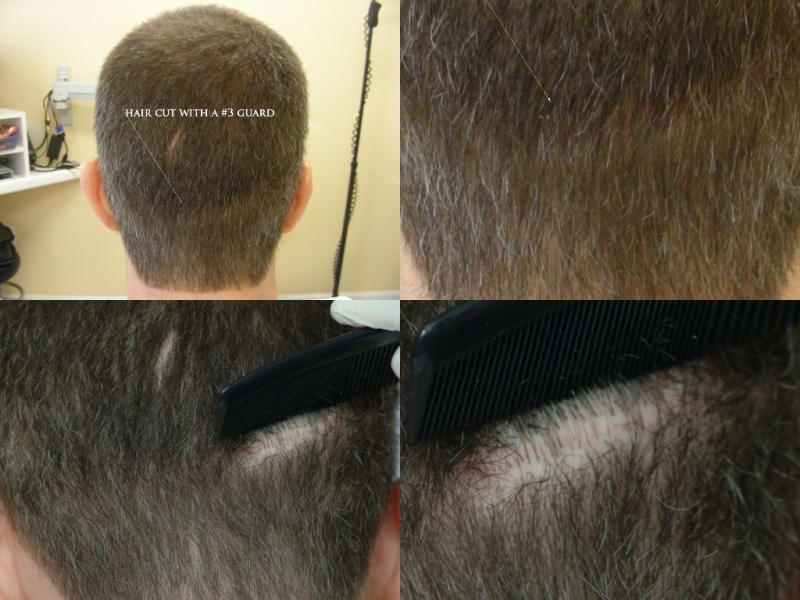 Most of our patients who have undergone prior methods of hair transplants (plugs, strip, scalp reduction) realize that they would have rather shaved their heads than bear the mark. They view having the mark as worst than being bald. These patients come to our clinic and want to be able to wear a short hairstyle and just look natural. Attached below are images taken of several donor areas of patients who had strip (FUT) harvesting performed prior to coming to our clinic. 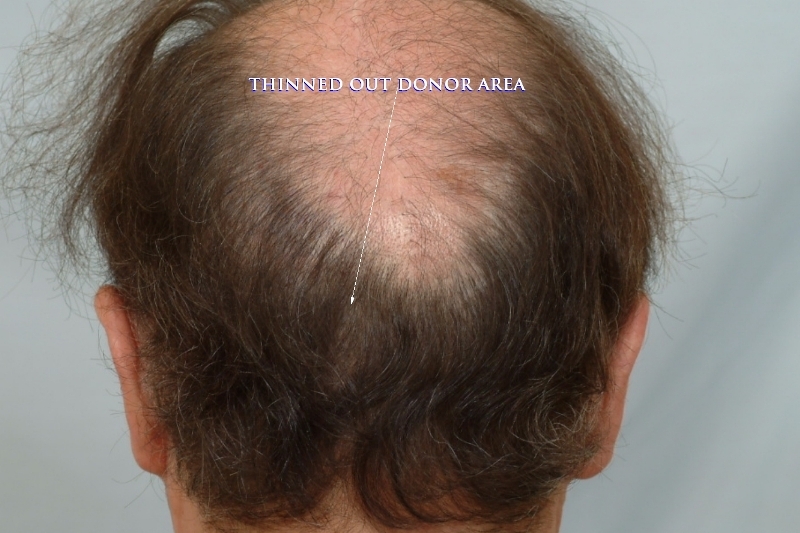 You may observe that each patient has moderately long hair in the donor area and that a considerable amount of thinning in each donor area is evident. Recently, it has been said that the average strip scar is 2 – 3 millimeters in width and that strip method is the common method of hair transplant surgery of today. Today, the most important question for a patient to have in mind before having a strip procedure is what to do with the scar after a strip procedure is performed. Strip harvesting can have more adverse effects in the donor area than most patients seem to know. Patients tell us that many clinics are vague in regard to the post-op healing. From a patient’s standpoint, strip harvesting is said to be more economical on the wallet than non-strip methods. 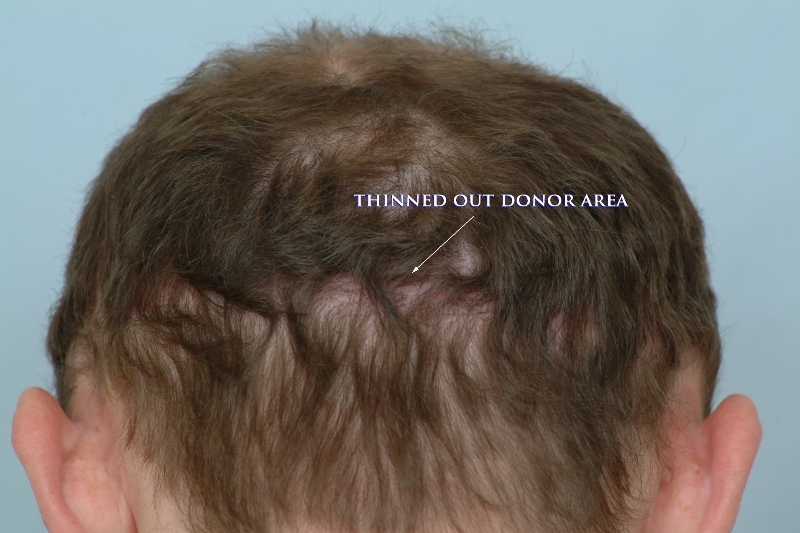 Many clinics offer strip as a way to transplant more hair in less time. We see strip method as more costly to patients’ donor resources and a procedure that fails to meet today’s standard of aesthetic results in the donor area. Patients seeking strip method don’t know how visible the linear scar will be once it’s done. It is a fact that each donor area heals differently from patient to patient. One thing is for sure: These patients will have a linear scar! Among other drawbacks are loss of sensation, tingling nerve damage, and a hypertrophic scar. To compound the problem, often times the pressure of the scalpel used to harvest the strip will destroy a percentage of nearby FUs and distort the direction of the hairs above and below the incision. These undesirable and disabling effects can be seen and felt even at a year or more after the strip procedure is performed. Some patients have scar revisions performed to see a percentage of the scar’s appearance decrease. 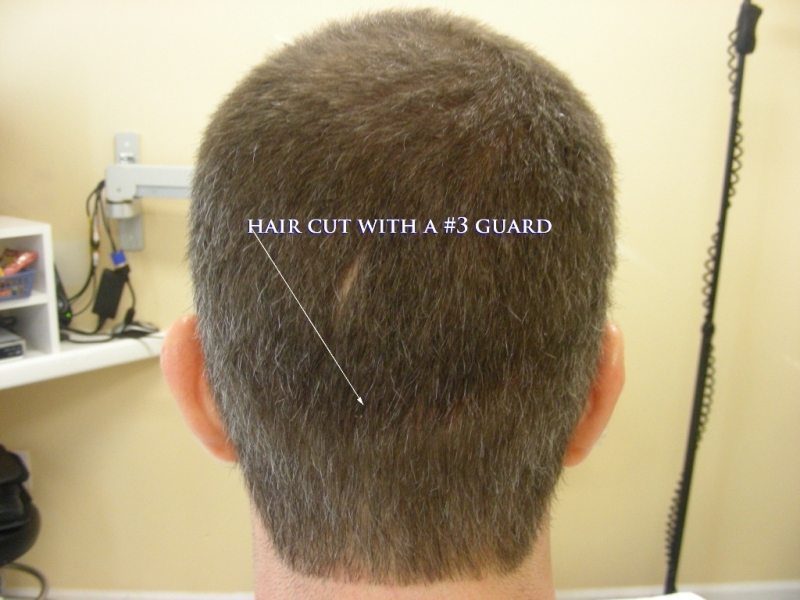 The last two photos attached show a patient’s donor area trimmed with a #3 guard. About 1 year ago, this same patient went to a well-known clinic for a scar revision. 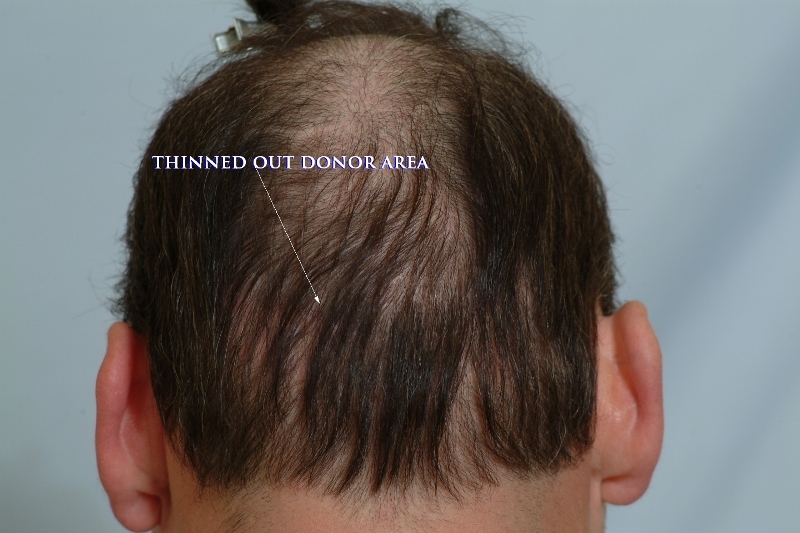 The patient’s hair in the donor area is 1.5 centimeters in length. 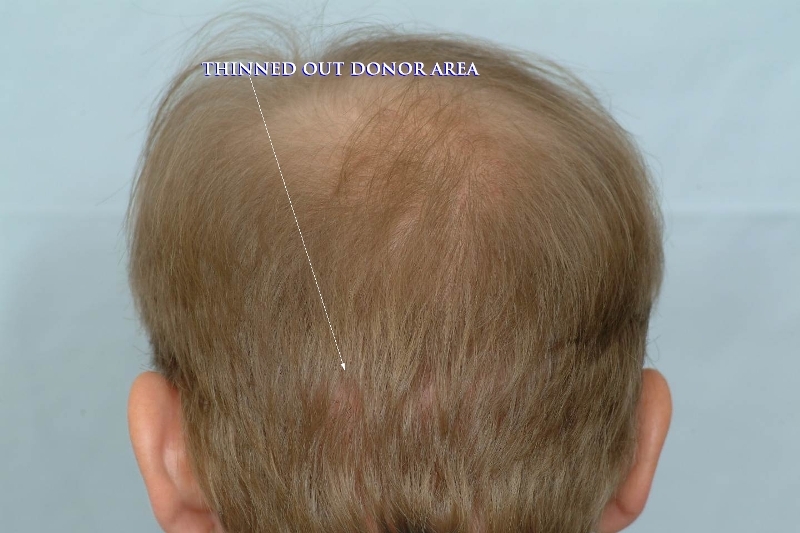 At the current length, the hair in the donor area fails to conceal the strip scar. 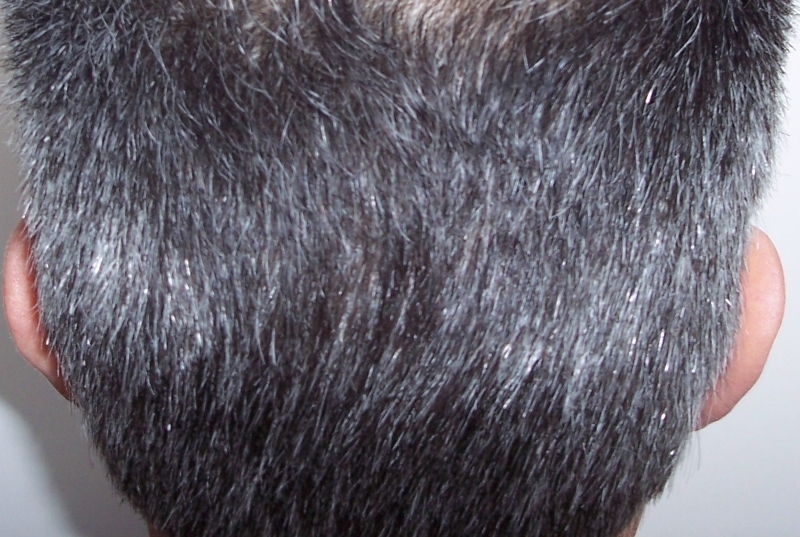 This shows that even an average strip scar must have adequate hair density around the scar for it to be unnoticeable. 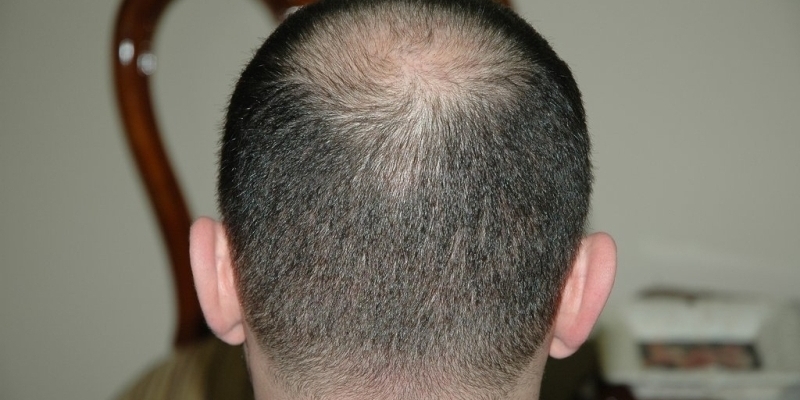 All hair transplant methods have pros and cons as any surgical procedure. The difference is what to do with it once it’s done! 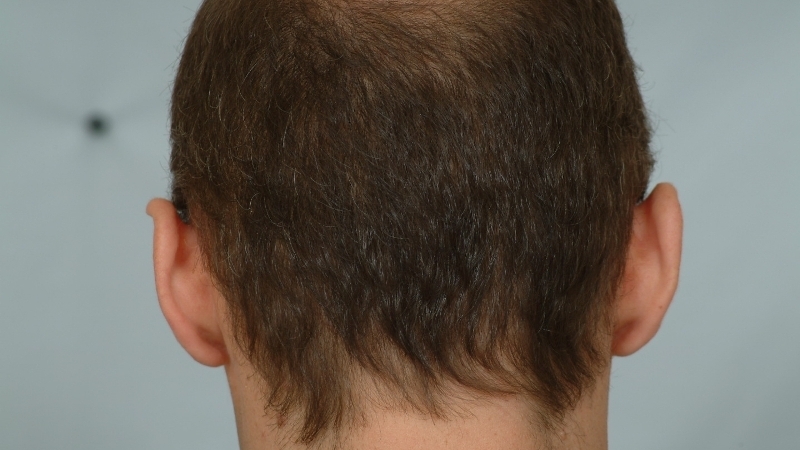 Patients who elect to have a hair transplant may more than likely need more than one hair transplant procedure in their lifetime. 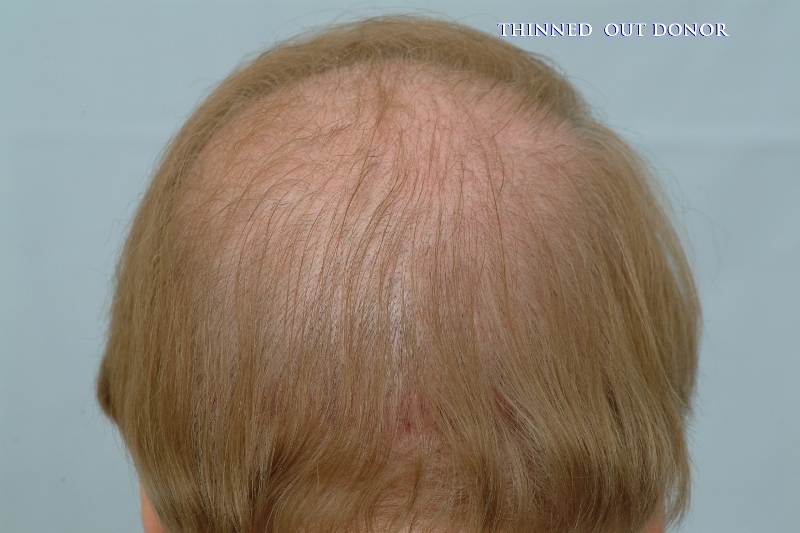 Many patients believe that the appearance of the linear scar is easily remedied via CIT or FUE, which is not the case. 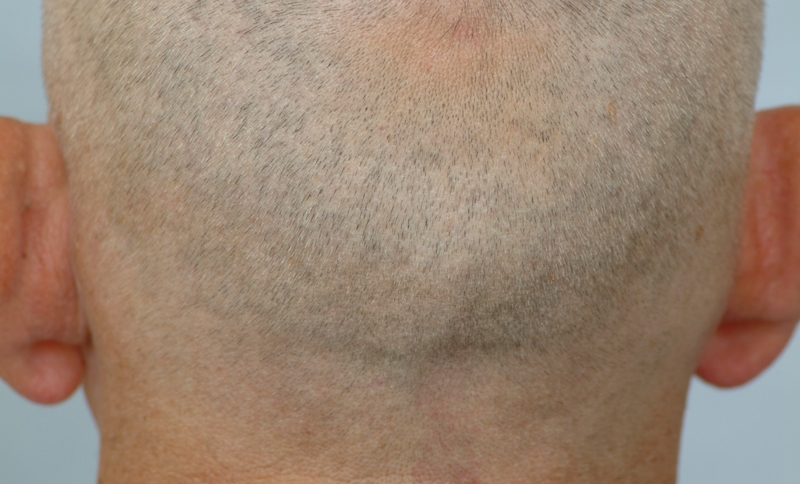 Grafting into the scar can be an option for many patients to minimize the appearance of the linear scar. Patients should be told that the cons of non-strip methods can be hypo-pigmentation occurring at the extraction sites in the donor area. We have seen that transferring follicles into the extraction sites can stimulate pigment to these areas. 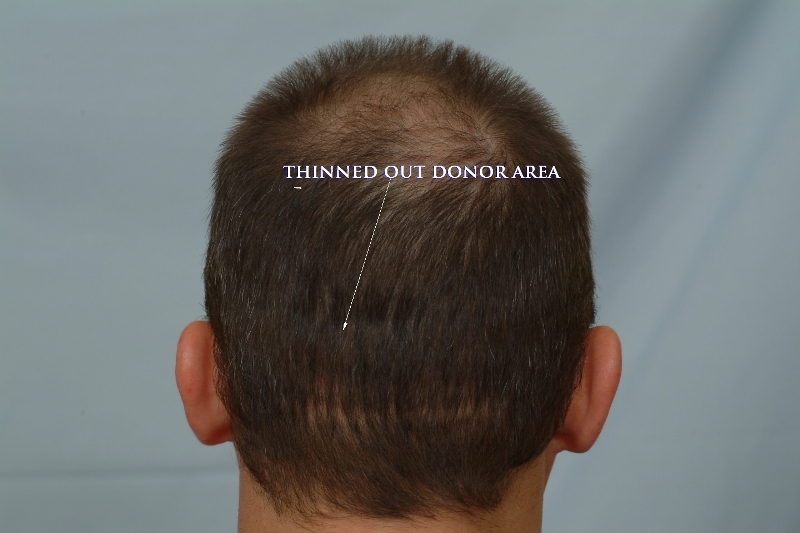 The second con associated with the non-strip method of hair transplant surgery is that most clinics typically offer it at a slightly higher upfront cost per follicular unit. Excellent questions to know are: “How is repair done if the linear scar widens after each scar revision?”. We thrive to educate patients so that their goals are realistically met while improving their quality of life. At any rate, we want to give our patients the opportunity to obtain the best aesthetic result in the donor and recipient areas. We offer our hands to patients who need help after it’s done. Not too long after FUE became mainstream there was a new buzzword. It does indeed work on some patients, but again the problems are far from solved. Scar stretching happens, it still does … and the biggest problem is that even the newest closure technique is far from giving the perfect answer. Does ne1 believe that this patient would have gone through a strip surgery if he had known his tricho closed wounds would stretch back ? Interesting, if you didn’t tell me, I would have thought those were FUE pics, why? Because the thinning in the pics didn’t happen to just a specific area but all over the back of the head. » specific area but all over the back of the head. Here are a few non-strip donors that have been harvested. Each has been harvested of one of the following grafts counts: 2200, 2700,4000, 5000, and 5000 grafts. These donor areas were harvested based on the donor density of each region of the donor area. We understand that donor density varies throughout the entire donor area. 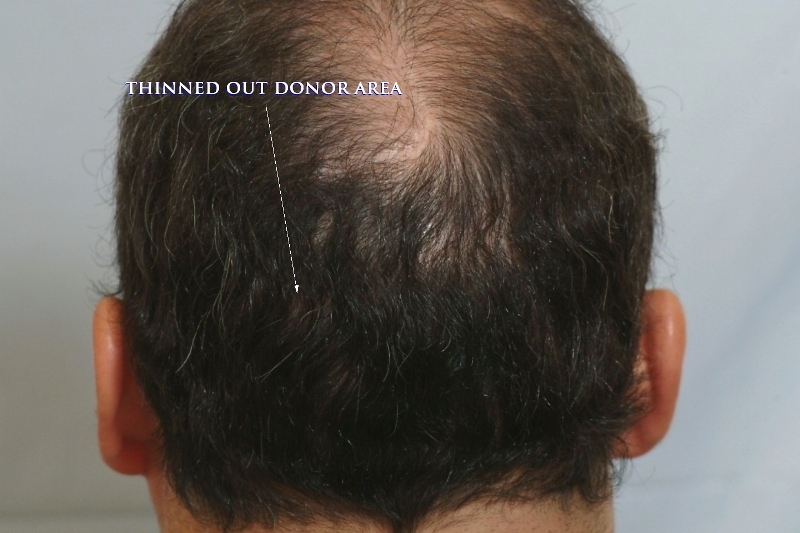 We extract grafts from within the entire donor area in order to minimize sparsity within the area. Actually, we are investigating Acell in regard to hair transplant. It is already FDA approved for use on humans. Currently, there are still some limitations, but we hope there will be more advances in the near future. » limitations, but we hope there will be more advances in the near future. Keep up the good work Doc, and interesting posts. » Keep up the good work Doc, and interesting posts. It’s depressing but I am happy that the truth is being told. Very interesting posts, as usual. It’s a good thing that all aggressive-hairlined Armani patients are automatically immune to donor thinning for life. 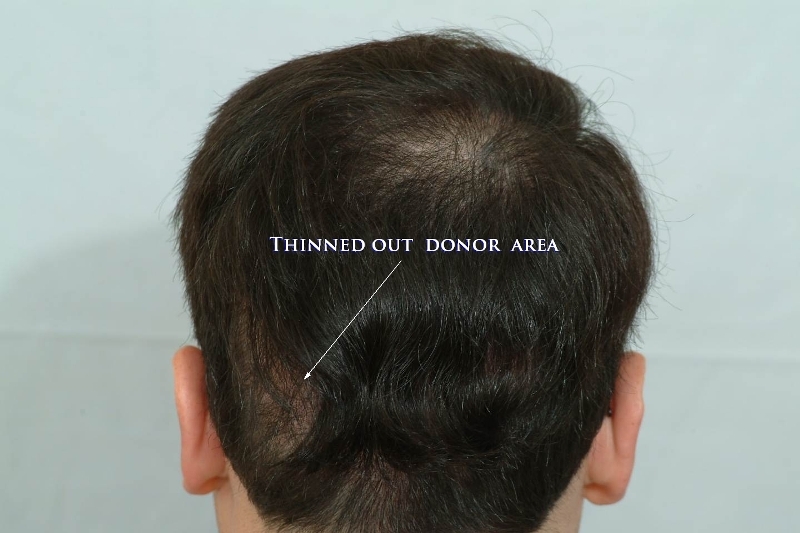 Otherwise donor thinning could eventually put them into even more trouble with FUE over-harvesting than they’re already in. » automatically immune to donor thinning for life. » with FUE over-harvesting than they’re already in. I concur with you whole heartedly my fellow forum member. 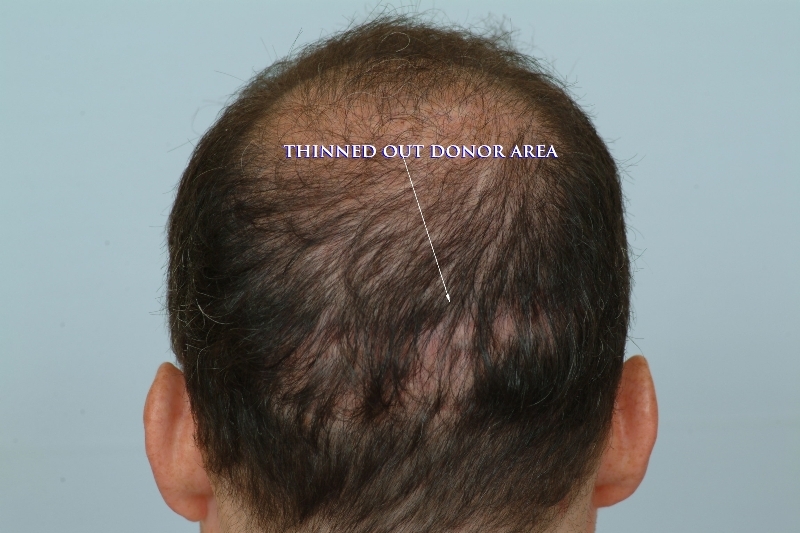 Donor thinning will take the attention off of the top and shift it to the back. As of this day, none of us are immune to the limitations of our donor resources. Doctors and consultants need to tell all patients that there is always a possibility that future loss can occur. 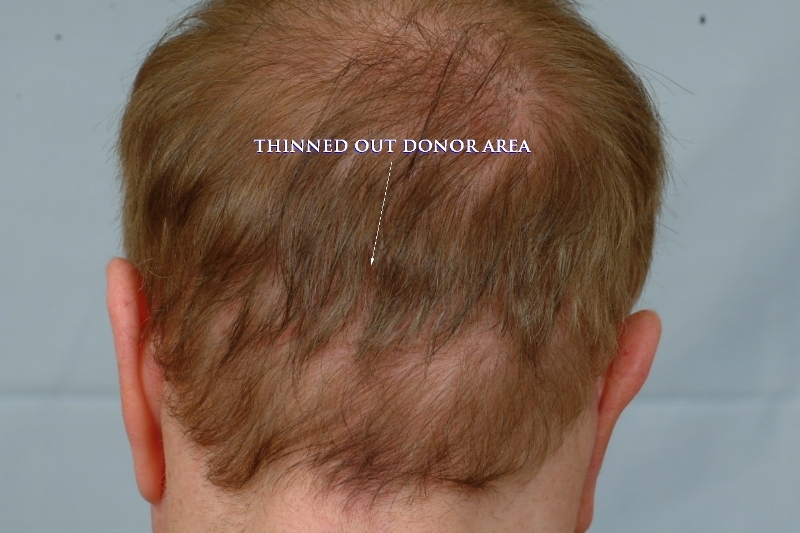 The photos attached to this tread are all examples of what occurs when patients are lead to believe that they can have more grafts transplanted at anytime. Through education and integrity, surgeons must devise a long-term treatment plan in since we don’t know what the future holds.